One of the earliest that I can recall was seeing a “snow melting machine” at work on a street somewhere in the city of Chicago, in a dream. I was very young at the time and would sometimes innocently and ignorantly talk about things I’d seen in my dreams with my parents, or anyone who might listen. I saw this machine as a large metal, open topped, box shaped, piece of equipment, painted in City of Chicago light blue. There was a large chamber under it’s bottom, and fire was being blown in to that chamber. That melted large quantities of snow, which were being dumped in to it by a large front end loader. At the end away from the fire-box, there was a drain pipe where the melted snow ran out and in to a storm sewer, through a manhole grate. I told my dad about this because it was a pretty good idea from my kid perspective. I explained it to him in the form of an idea. He told me it was stupid, and “they would never make something like that”. A few years later, after some big snows in Chicago, there it was just as I’d seen it, a news story on the TV evening news and in a newspaper. I pointed out that this was something I’d talked about before. The city actually had a few of these now, and they were using them to get rid of snow instead of piling it up in some places and areas. They didn’t use them for very long though, maybe just a year or two. I didn’t get any kind of reaction that I recall, but that doesn’t mean there wasn’t any. Told my dad that Kennedy would be elected. I was too young to even know what that meant, much less what a president or government was. Wasn’t even in school yet. Just knew that and blurted it out one day. Had lots of dreams, saw lots of things that would eventually happen exactly as I’d seen them. Mostly knew the people in them, the places, and what much of, if not all, of what would be done and said. Like a video or movie clip being played back. I could always tell the difference between the predictive dreams and just plain old dreams. It was easy because they were always so different and realistic. They usually repeated several times at least. They never varied. Always began and ended at the same points. While having one of these dreams, I was the “observer”. The moment on of the these dreams began, I would instantly recognize it and I would be living it. Everything that would be done and said by anyone in it, including myself, would happen exactly as I had already experienced it many times. These dreams seemed to be unalterable, indelible, and unstoppable as they played out. What made them scary was that they would be short sequences taken out of the context of reality. I had no idea what was going on before or after the timeline of any dream sequence. When they happened, they were just there, already in progress. Some times, taking something out of context can make it very terrifying. It can also hide a danger by making something seem innocent, non-threatening, and mundane, when it is in fact none of those. When I was 11, I was chosen to be the Godfather for a newly born niece of mine. I don’t think this is significant, other than it puts me in place to live through a dream that had scared me for a couple of years. I was standing, looking out of an unusual window, and I was saying, “They should be getting here very soon, in just a few minutes.” I was having this dream fairly often, and it became very disturbing. In the dream, I could see a very bright flash light up a whole area above some trees, in an arc shaped dome of light. It was quickly followed by brighter, closer, arc shaped flashes, in a definite progression towards me. There was a sequence of 3, followed by a 4th flash which completely filled the whole view. That last flash engulfed everything I could see, and it was clearly overhead and all around too. That dream ended there, and nothing seemed to follow. It was the middle 60’s, and the possibility of thermonuclear war was a reality. I wasn’t having any other dreams while I was having this one. Nothing seemed to be beyond that dream. My impression was that I was seeing my last moments before being fried in a nuclear blast, and that maybe my comments about “them being here soon” were about the arrival of some bombs or missiles from some unknown place. It was one of those dreams, so I had no doubt that it would happen, and as I could see myself, my age, I knew it was coming soon. I never spoke to anyone about it. I knew it was unavoidable and would happen no matter what I did. So why tell anyone and maybe scare them too over something that would certainly happen? The day of my niece’s Christening, Baptism, came. I was already at my sister’s house, maybe a day or two before, because the ceremony would be early. Needed time to be ready. My parent’s house wasn’t close by, and they had almost an hour drive to get there. They hadn’t arrived yet. I often would stay with my sister and brother-in-law, visiting for days at a time. At that time, they were living on the main level of a huge old farmhouse, renting it. The upstairs part of that house was a whole residence itself, rented by another family. This being a big event, a gathering of family and friends was planned for that day there. In the living room, there was a very large bay window. It was made up of many squares of glass, maybe about a square foot each, held in place by a wood lattice-work. There was a large platform inside the area created by the curvature of the window, enough to hold several potted plants. There was a drape that hung in front of the window, a 50/50 split draw type, which was usually wide open, or completely closed. That day, the drape was drawn about 2/3 closed. Then it happens, the dream… I had stopped, and was standing in the living room, as my sister was saying something about how she was wondering when our parents would be getting there. Looking over, and out the front window, I recognized that “strange window” from my dream. Without even thinking what to say, the words just rolled out exactly, “They should be getting here very soon, in just a few minutes.” As I was speaking those words, the feeling of dread knowing that those flashes were about to happen gripped me. In the next instant, exactly as in my dream, there were those flashes! My heart was pounding and I’m pretty sure I was holding my breath as I watched the flashes progress toward me and the farm-house. Each one a larger, higher, brighter, dome of blinding light than the last, until the last one engulfed everything I could see outside. It was over head. A storm was moving in, and what I had just seen was lightning. I was still there, and nothing had become a cinder. Our parents arrived a short time later, and I privately relished the great sense of relief for the rest of that day, and for many days afterwards too. There have been many dreams. Before I had ever met the girl who would become my wife, I saw her, saw her family and relatives, where she lived. I knew her face at the time we would meet. When the day came that we finally met, I had no doubts. My dreams, those dreams, were always true. Later in life, after our kids were adults and starting their own families, we finally bought our first house. In a small town outside of Reno, Nevada, we found a place that suited us. The first time I think I had “the floating trailer dream”, I think we hadn’t even moved out west yet. I could see a fence at the back of what I felt was “our yard”. Beyond the fence, there was a lot of water rushing by, like a small river that shouldn’t be there. In the water, there was a small camping trailer, maybe 12 or 16 feet long, not too big. I never expected to move from the first house, eventually buying a 2nd house in Nevada. The fence at out new house looked right, because of the height, style, and types of boards used. Just like the dream. But, there was only a small alley way between our back fence and the one across from it for the house on the next street. To see a small camper trailer out there, in water over its wheels, would have meant that I’d be standing in at least knee-deep water looking out my back door at it. In my dream, I could see the water but wasn’t in it. After living in that first house for about 4 years, we bought a larger one in the same town, less than a mile from the first one. The newer house had the same kind of fencing, common for that area. And there was a small trailer sitting on a property behind us. With the slight difference in elevation, that trailer and where it sat was clearly visible from our back door. They also had a few horses as well. At some point I had told my wife about this dream, while we were still at the first house. Now here at the second house, some of the things were there, as far as scenery went, and I mentioned that too. But, we’re living in the “high desert” country, and not in the lower parts of town at all. So where could all of this water possibly come from? There was a lot of water going by in the dream. One icy cold January morning, I was up getting ready to leave for work. It was still dark outside. There is a pounding on our front door, the kind that means either there is trouble or someone needs help, so I rush to the door and open it. There is a Lyon County deputy there. He says, “There is a river running through your backyard, you need to evacuate now, go to the high school!”, and then he rushes off in the darkness towards our neighbor’s house. I could hear a loud, steady sound outside, just before he showed up. It sounded like a strong wind blowing, and low roar of sorts, common for there. I went to our back door, a sliding door, and opened it expecting “the wind” to blow in my face. There was no wind blowing, the trees weren’t moving at all. I peered in to the darkness long enough to let my eyes adjust. I didn’t see any water in our backyard? Then I saw that beyond our fence there was a torrent or water rushing past, and it had to be about a block across to the other side of it. That trailer was there, sitting in that river that was, where no river is and none should be. Shut that door pretty quick, woke everyone up, grabbed the dogs, and we left quickly in our vehicles. Got to the high school, and stayed there until late morning. Wasn’t sure what we’d find when we went back. Lot’s of stories about damage and people being evacuated, air lifted, from their homes. When we got back in the daylight, there was the scene from my dream. That trailer in the water, still fairly deep, out beyond our fence. There is a large irrigation channel that runs through the town, carrying water from the Truckee River to the Lahontan Reservoir. From there, it goes all the way to Fallon, Nevada. A section of this channel runs along the southern portion of Fernley. Part of this system is made of a “levee” to create a channel for the water to run through. A section of the levee failed suddenly, resulting in a great deal of water flooding through town. So there you have it, just a few examples. Some have had some significance, some have just marked events. It’s not some sort or magical power, or anything I can control. The dreams have always come along on their own, without influence from me. At best, I would think that there maybe be some kind of message or lesson manifested because of them? It could be before, during, or after the moment? Lastly, these are also distinctly different from moments of Deja vu, in that it’s something that happens at a ‘now’ point rather than feeling like something that’s happened before. 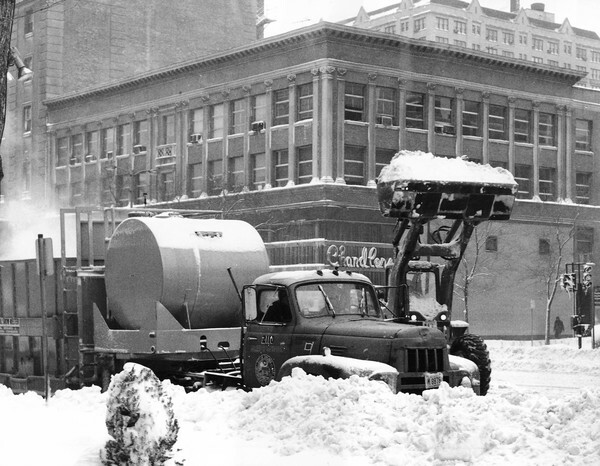 I happened to run across an old newspaper photo of the “Snow Melter”, which I had downloaded and save a long time ago. This was the machine i saw in my dream at that time. To be continued with Remote Viewing and ESP…. This entry was posted in Paranormal and tagged belief, dreams, esp, foresight, intuition, jedi, men who stare at goats, precognition, premonitions, remote viewing, right place right time, seeing around corners, seeing the future, sixth sense. Bookmark the permalink.